Turn on to the vintage charm of natural spring reverb coupled with pulsing tremolo. Source Audio doesn’t depend on the off-the-shelf reverb effects processors found in many modern reverb pedals, we meticulously craft every one of our proprietary effects engines and load them to high-powered, 56-bit Sigma DSP. Our two man engineering team of Bob Chidlaw and Jesse Remignanti put years of collective man-hours into capturing every nuance and idiosyncrasy of the spring reverb and tremolo effects from some of the music gear industry’s most iconic guitar amps and outboard gear. The result is indisputable sound quality with magnificent tonal depth and precision. Andy Martin of Reverb.com offers a blind comparison between the spring reverb and tremolo effects of the True Spring Reverb and those of a Fender 65' Reissue Deluxe Reverb amplifier. Can you tell which is which? Mike Hermans takes a long look at the True Spring Reverb's reverb and tremolo effects. Hear the True Spring in a band setting as well as and in-depth knob twisting segment. Bassist, ​Nathan Navarro goes surfin' with the True Spring Reverb. You still think spring reverb and bass don't go together? "Not so," says Navarro. There is nobody more obsessed with the "drippy" tones of a quality outboard spring reverb tank than Ryan of 60 Cycle Hum: The Guitar Podcast. Check out his initial reactions to outboard spring sounds of the True Spring Reverb's TANK engine. Out of the box, the True Spring Reverb couldn’t be simpler – just plug it in, select from the three onboard reverb engines, dial in some tremolo if you like, and start making beautiful music. But something deep and powerful resides just below the surface - the truly “Big Idea” behind all of our One Series pedals is the second, far deeper, set of options and editing tools for crafting the perfect tone. The Neuro Mobile App is available for free at the App Store (iOS) and Google Play (Android). The Neuro Desktop Editor is available as a free download for Mac or Windows systems on our Downloads page. These powerful editing tools offer an advanced collection of deep editing parameters. After customizing your sound, burn it directly to the pedal and easily access it anytime without having to reconnect the Neuro Mobile App or Neuro Desktop Editor. Universal Bypass — Select Active Analog (Buffered) or True Bypass. 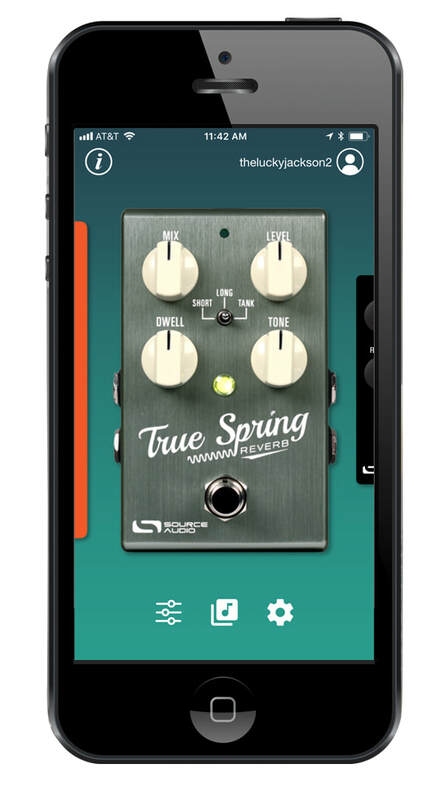 Secondary Tremolo Controls - Press and hold the CONTROL INPUT button to access the True Spring's tremolo effects (DWELL knob controls tremolo DEPTH / TONE knob controls tremolo RATE / toggle switch selects tremolo type). Expression Control — Compatible with Source Audio expression pedals and the Hot Hand 3 Universal Wireless Effects Controller. Assign up to three simultaneous parameters with editable depth and direction. External Tap Tempo – Use the Source Audio Tap Switch to tap in the tremolo rate with a choice of four different beat divisions (quarter, eighth, triplet, and sixteenth). External Tremolo Engage and Bypass – Use the Source Audio Tap Switch to engage or disengage the tremolo effects on top of an active spring reverb. Connect the True Spring Reverb to the Neuro Mobile App (a free download for iOS and Android) or the Neuro Desktop Editor (a free download for Mac or Windows computers) and explore the power of effect downloading, customization, and sharing that comes with every One Series pedal. Interchangeable Algorithms — Upload any of the additional reverb or tremolo effects directly to the pedal at no additional charge. Customize Effects — Tweak an additional set of parameters including advance EQ, pre-delay, diffusion, reverb modulation, virtual spring length, and more. Save and Share Customized Presets — Once you’ve fine-tuned an effect, save it to your personal effects collection in the cloud and share it with the growing community of Neuro users. Download Presets — Explore Source Audio’s ever-expanding library of effect presets. Choose from Source Audio Factory presets or presets created and published by members of the Neuro Community. Signal Routing Options — Re-route the stereo Inputs and Outputs in a number of different ways including Auto Detect, True Stereo, Mono to Stereo, External Effects Loop, and more. Simple Connection — The Neuro Mobile App. connects with the True Spring via the mobile device’s headphone jack and Stereo Input 2 on the pedal. A Neuro App connector cable (1/8” to 1/4”) is included with the pedal. USB Connection – Use the pedal’s mini USB port to connect the True Spring to the Neuro Desktop Editor, which can be used to edit presets or download the latest pedal firmware. The True Spring Reverb also features full MIDI capability and simplicity when coupled with the Neuro Hub (formerly Soundblox Hub). Preset Saving – Save up to 128 effect presets. Multi Pedal Scene Saving – Connect up to five One Series and Soundblox 2 pedals to the Neuro Hub and create 128 multi pedal scenes, recallable via MIDI program change messages. External Expression Control – Connect the Neuro Hub to any Source Audio expression pedal, Hot Hand 3 Wireless Effects Controller or third party TRS (Tip Hot) expression pedal and manually control effect modulation or assign individual or simultaneous expression control to any adjustable parameter. MIDI Clock – Sync your tremolo rate with external MIDI clock messages.